Power sweeping is considered a Best Management Practice under the EPA Clean Water Act and Clean Air Act. 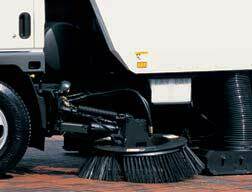 Today, street sweeping is being done for many more reasons than its purely cosmetic value. Power sweeping has been shown to be a Best Management Practice (BMP) by the US Environmental Protection Agency. For a PDF file that provides more information the pollutant reduction value of highway sweeping, click on the link to the right. When you need a street or construction sweeping contractor, you will find there are many reasons why Custom Sweeping Service is your top choice. Sweeping was started in the early 1900s for 'cosmetic' reasons. Today, material on the street has a much higher potential for being hazardous than ever before. Health issues from fugitive dust are responsible for over 1 million cases of asthma per year. Studies show that air sweepers and broom sweepers can pick up pollutants at a cost of less than $5 and $10 per pound, respectively. In contrast, a study by CalTrans showed that capturing pollutants in the runoff stream averages a whopping $35 per pound – and that didn't include the cost of the real estate needed for most end-of-the-pipe retrofits. PM10-compliant street sweeping is a recognized Best Management Practice for construction and community compliance with NPDES Phase II stormwater run-off program. When roadway debris is kept cleaned up, citizens take more pride of ownership in their locale and tend to throw less litter from their vehicles. Weekly sweeping and cleaning is proven to maintain particulate compliance and can reduce suspended solids in downstream receiving waters by more than 75% (Source: EPA 832-F-99). When sand, grit and other smaller micron debris, especially, is allowed to accummulate on roadways, the road surface becomes more slippery and can contribute to a higher risk of accidents. Sand, dirt and other trash are abrasive, and will shorten the useful life of pavement, as well as the length of service time of any sealcoating, striping, etc. throughout the United States and international power sweeping industry.